Hello there, fellow movie fans ...! I'm always glad to encourage anyone to attend Bradford's Wide Screen Weekend ("WSW")! It's a fun gathering, taking place in an interesting (interesting to me, anyway) location. You participate in it with lots of others who value the same kinds of experiences. This is written with a goal of assisting "first timer" attendees coming to Bradford and England from distant shores. It also will be applicable for Europeans visiting -- just bypass the transatlantic airplane stuff! I'm sometimes blessed by being a bit too "chatty", at least when writing things, possibly a mixed blessing. So, to save you time, I'll give some condensed observations here at the beginning, and then (for those especially interested), more specific details follow farther on, which you can read at your leisure. Bed & Breakfast for 2 nights @ £46.00 per person per night sharing a Standard Double/Twin bedroom. Bed & Breakfast for 3 nights @ £42.00 per person per night sharing a Standard Double/Twin bedroom. 3 night reservation will be upgraded, subject to availability, and will be given a complimentary bottle of wine in their bedroom upon arrival. Bed & Breakfast for 4 nights @ £38.00 per person per night sharing a Standard Double/Twin bedroom. 4 night reservation will receive the above and Dinner complimentary on one of the evenings. *Premium bedroom supplement of £10.00 per person per night. *A single supplement of £30.00 applies per room per night. Dinner will be available from £16.95 per person, per night with a Special Themed Menu running throughout the festival. Bookings are to be made directly through the Midland Hotel and festival guests will be advised to quote "Bradford International Film Festival" when booking. 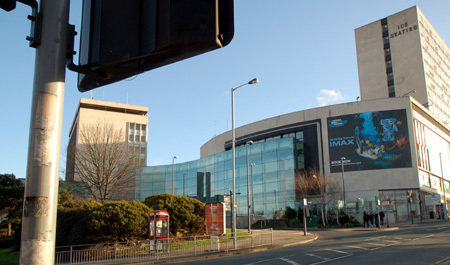 By way of background information, most Bradford WSW event(s) take place at the "Pictureville Cinema", which is part of the National Media Museum ("NMM"), (formerly called the National Museum of Photography, Film & Television, "NMPFT"). Also part of this complex are the museum facilities itself (an interesting place to visit), and two other cinemas: an IMAX theatre, plus a much smaller place, the "Cubby Broccoli Cinema", a nice intimate room for "smaller" shows and videos. A few shows may be scheduled in those venues. Obviously, anything IMAX has to run in the IMAX site. I typically like to approach the trip as an entire travel experience, so I may not always take the most direct route. When I discuss costs, I'll mostly be doing so as costs appear to us now, as written in early 2009, when the dollar is VERY LOW vs. the UK pound(£). At the time of the 2008 WSW, it was about 2 - 1, so UK £ 50 was about US $100. Check for current exchange rates. Travelling to, and in, the UK, presently, will cost you some money, no doubt about it, because of the currency issues. But there is nowhere else can you see some of these cinematic treasures! 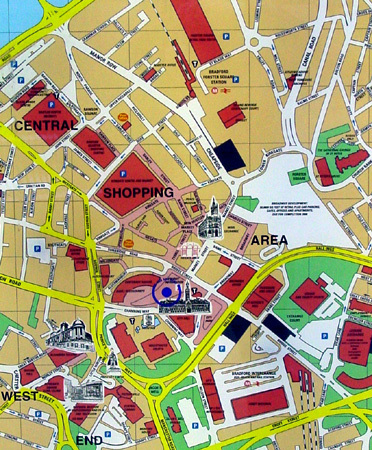 Bradford is approximately 175 miles (278km) north of London. Unless you are already in the UK, your trip to Bradford will very likely include both air and train travel components. From the Continent, you can do it entirely by air, or entirely by train, or a combination. From overseas origination points, you'll probably use some of both. For train only, you may skip to the "Access from Europe" section, below. If you come by air, there are 3 principal airport options to consider: #1) London, of course, actually with several airports – the 2 primary ones being Gatwick (LGW) and Heathrow (LHR). London also has the 3 outlying regional airports: the smaller "City" airport (LCY), and the farther-out Luton (LTN) and Stanstead (STN) airports. Farther to the north, option #2) Manchester (MAN), another large airport with both Transatlantic and intra-European flights. And, of course, #3) Bradford's local airport, (LBA), smaller, but the closest to Bradford. 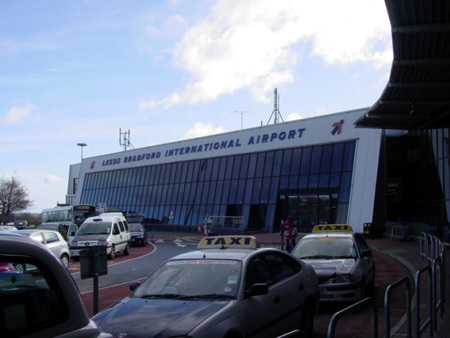 Bradford's airport (LBA) is the closest to Bradford. If time is short for you, and you take a taxi in to town, figure on an additional taxi fare of some £15 - £18 (approx. US$ 30 - $36) to get into Bradford. If your time permits, there is now a fairly economical bus connection from LBA in to Bradford, and that fare will be slightly more than £ 2. Euros are accepted. Change will be returned in Sterling). You will have to spend some time calculating your airfare costs + your ground costs, to figure out which routing works best for you, in terms of total cost. Air fares often vary based on unpredictable nuances in times and days, as perceived by airline "revenue management" types, so some persistence is required. I cannot say flat out that a routing via Manchester is cheaper than, say, coming in to Bradford... it will depend on your schedule and what other conditions apply to the route(s) and time(s) you select. The tools and links provided here will assist you in figuring let you figure your costs fairly well. If you fly to London or Manchester, etc., you'll have to take surface transport to get to Bradford. Trains are the most readily-available option; there are buses, but I've never tried them and can offer no information. Rental cars are also available at all airports, though useful mostly if combining your trip to Bradford with visits to other nearby scenic areas, e.g. the North York Moors or Yorkshire Dales national park, or the east coast seaside resorts of Scarborough and Whitby, which either have very minimal public transport or none at all. Here is a link to the (very good) UK rail system travel planner website; you can estimate your additional costs (on top of your airfare costs) and come up with the total cost(s) for your trip to Bradford. There is a cafeteria in the adjacent NMeM building, open mostly during "daytime" hours. The cafeteria kitchen also conveniently supplies light "snack-" type foods to the Pictureville Cinema bar, immediately outside the theatre entry doors. You can eat light snacks in either place (subject to opening times and availabilities), or you can go out from the complex. You do not need to go hungry! More details in the "Restaurants and Food Service" section below. That ends the "summary" information: Transportation, Hotel, and Food. Now, I'll go into a bit more detail. If you don't want to read it "all", please skip to any area that may be of interest to you. For people from the USA, you'll be flying "across the pond". Many routes and ways to do it! (If you are originating from somewhere on the European continent, see "Access from Europe", below). Depending on your wishes and time constraints, you can fly to England's "main city", London. 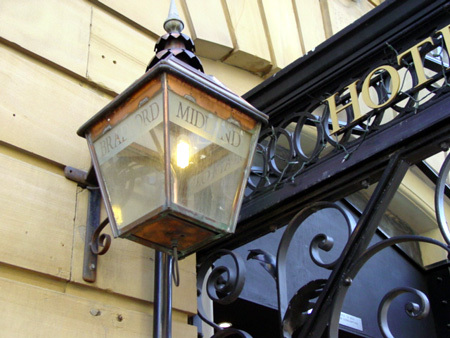 This allows you to visit a few historic spots (time permitting) in London, should you wish. Also, sometimes, airfares are cheaper (but also, sometimes, more expensive!) to London... Factor in, however, that you'll have to take a train from London to Bradford, a trip of about 3+ hours, at additional cost.... If you're into trains, this can be a great treat -- quality high-speed railroading (not super high speed, but good quality mainline rail service). The train fare will be additional cost, see discussion about rail fares following. As my comprehension of the system has improved, my fare has gone down. In 2005 I paid £52; in 2006 I paid £71; (2007 was air-only); in 2008 I paid 38. Caution about LHR: If you fly in to the London Heathrow (LHR) airport and are planning on making a "direct" airline connection to LBA, or anywhere up north, advice from folks who live in the UK suggest allowing PLENTY of time for the transfer. Arriving flights from the US arrive at Terminals 3 or 4, and domestic flights operate out of Terminal 1. Getting between them will tax the hardiest traveler and add stress and considerable time, not to mention possible long immigration queues. If you can avoid LHR for such same-day connections, do so. And while I’m on the subject of air travel in the UK, one other cautionary note, in case you happen to drive into the UK via train but plan to fly out … update yourself on the current hand-luggage regulations for the UK. They have been quite restrictive in the amount and contents of carry-on luggage and if you’re not careful, you’ll find yourself being required to check some additional piece(s), at potentially outrageously high costs! You might also check the Newcastle airport, too (code NCL), to see if you can find a cheap flight there. Newcastle is presently being served by several "low cost" airlines and there could be some amazing promotional fare to Newcastle that works out for you. But the ground transportation to Bradford could be a bit more difficult (and longer) than from MME or MAN, so is suggested primarily for the intrepid traveler! One final airport idea: since you almost certainly will have to take a train trip to get to Bradford from these various "distant" airports, another UK arrival city you might also think about would be Glasgow (Scotland), (GLA). In terms of time and cost of getting to Bradford, it's about the same (178 miles, 285km) as coming from London. 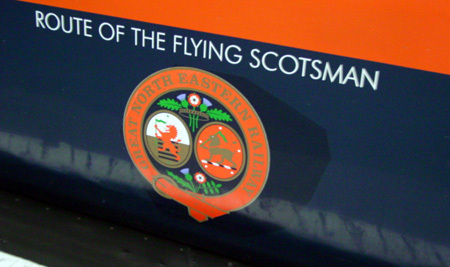 So, if you want a more northerly bias to your trip, this one could be worth checking. If you fly to Bradford airport, taxi fare in to Bradford proper will run about (maybe) £15 - £18 , or US$30 - $36. If you plan to arrive here, if possible try to have some UK £ before arriving in LBA, because the change kiosk at the airport is small and may be busy. (It's a rather smallish airport). A taxi is the most direct way to get in to Bradford City. One big plus will be that the taxi will take you directly to your hotel. There is a taxi queue line out in front of the airport; usually waiting times are short. 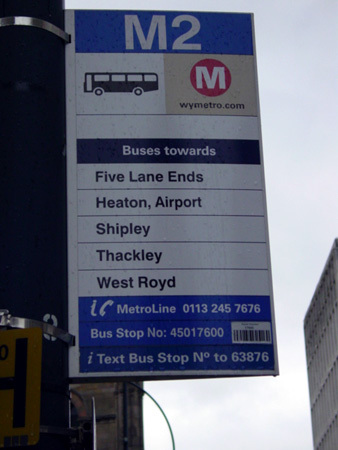 Bus service: NEW started in 2008: There is now halfway decent bus service between LBA and Bradford’s center, including stopping at both railway stations. 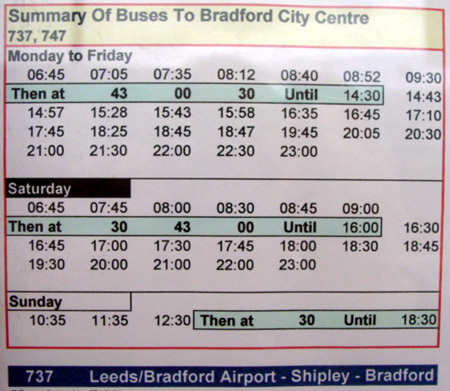 The West Yorkshire authorities have now instituted regular 6 am to 10 pm bus service between LBA and Bradford City. 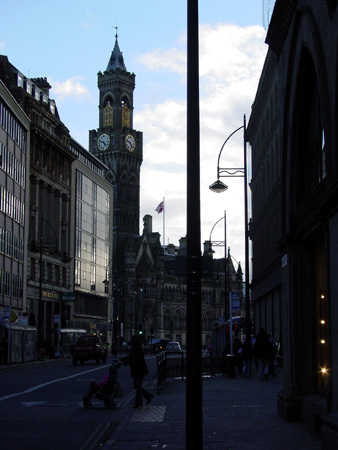 The bus route currently terminates at the Bradford “Interchange” Station, but it stops along Market Street, in Bradford, which is just steps away from the Midland Hotel. There are 2 bus routes operating, #737 and #747 (where did they come up with those numbers, I wonder?). For full details on times and prices, go to wymetro.com. The route #747 is slightly faster in to Bradford, at about 40-45 minutes. One different variation for air travelers is to fly in to one city, and return from another. If you do that, fares may vary, up or down. Or not. Airline fares are quite changeable, perplexingly so, as you probably know. Occasionally (but not always) flights tied in to overseas fares are somewhat independent of the final destination. I most frequently have been flying in to London, and flying out from LBA, but my choice of arr and dep airport changes year by year, depending on what I may be carrying and who's with me (if anyone), etc., etc., etc. Keep in mind you can also do this “open jaw” kind of itinerary on award points, typically at zero additional cost. If you are coming from the European continent, you probably have plenty of ideas about how to get to the UK. Air service is generally considered the most time-efficient -- but probably not by flying in and connecting through London Heathrow. If you fly in/out of the Bradford airport, or even Manchester, you are able to do it all in one day. You have a selection of various airports. For the budget-conscious, I suggest you study carefully the airports [listed above] and rail options (in terms of costs) to determine the "real" total costs of getting to Bradford. Discount airlines often fly to out-of-the-way airports, so, once you tally up the additional ground transport costs, your total may come to more than flying a traditional airline in to one of the "major" airports. One new option for train travel (as of late 2007) is the newly-improved rail link, the "Eurostar" service, which recently completed the high-speed rail portion in the UK, allowing much better (and faster) service from the Continent to central London. And, the London Eurostar terminal is now at St. Pancras station -- and that one is immediately adjacent to Kings Cross station, the London originating point for train trips to Bradford. Read the information below, and then, if you want to search for specific information, the UK "national rail" travel information service has an excellent website, which is quite a good site for getting pricing and schedule information on rail journeys everywhere in the UK. Thanks to the internet, it’s possible to be quite thrifty in purchasing train tickets, assuming you can make plans in advance. Of course, that comes with the usual warning about “advance purchases”: if you change your plans, or miss your train, the headaches (and increased costs) can come your way! As my comprehension of the system has improved, my fare has gone down. In 2005 I paid £52; in 2006 I paid £71; (2007 was air-only). All those was before I used the web-based scheduling system. In 2008, using the internet for a “moderate” [about 2 weeks] advance purchase, I paid £38, and others reported fares as low as around an incredible £12. The national railway booking system link is nationalrail.co.uk, and I highly recommend it for the thoroughness and ease of use. Same day fares can be over £85! The system will book up to 12 weeks (3 months) in advance. Without being privvy to their booking algorithims, I can say that you’ll probably get the lowest fares if you book at least one month in advance. To use the system, you select your routing, date, and time, and when ready, put in your credit card number. When you arrive at the point where your train ticket will originate, insert your credit card into marked terminals in or near the ticket offices, and … zip! … out pops your pre-paid ticket. 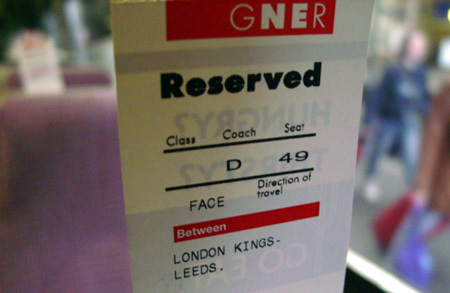 In my experience, for London to Bradford, it is essential to buy the ticket at least one day before the trip, i.e., "advance purchase". If you buy the ticket same day of travel, and it's a weekday, they'll charge you plenty. When I've been in London, I've typically purchased my ticket (the day ahead) right at Kings Cross station, just to be SURE I've got the station location set in my head, relative to where I'm staying, and I don't miss something. Of course, if you're not going to be in London the day before, that option is not available. You can pre-purchase your ticket for most or all of these trains from the national rail website but if so doing, be sure to allow yourself sufficient time for connections to your station of origin. The tickets I've bought have all been reserved seat ticketings, for a specific departure time. If you miss your scheduled departure, you'll lose some value. For Manchester to Bradford, it's basically a longish commuter ride -- albeit with nicer commuter railcar equipment for the service. The purchase price for single trips will not change all that much, so I don't see any urgent need for one to buy far in advance on that one. You may as well just get it at the airport. But still ... reports are that you can pay for your ticket in advance on this route, as well. You use your visa card from "home", and then get your ticket issued automatically at the airport station ("prepaid"), thus availing yourself of the advance purchase discounts. I have not personally tried this option and don't know if there are any reserved seat/specific departure time issues here (I doubt it). Word of this option comes from a reliable source. You might save as much as £2 or £3 for the trip. Some trains run from the Manchester airport station right through, direct to Leeds. Some others require a change [in Huddersfield - same platform, ed], and possibly two changes! When you board your train, be sure to ascertain whether it actually will be going to Leeds, or not. And if not, where do you change? And at Leeds, almost invariably, you must change. All this changing shouldn't be a problem for you, as the platform announcements and electronic signage are usually quite good -- but if you're arriving from an intercontinental flight, you'll likely still be a bit groggy. Be careful. The UK rail website is, again, quite good at providing schedules, times, change-of-train locations, and costs, so that should be your guide. If you can print a copy of "your" itinerary before you leave, you'll be much better prepared for the train portion, if you've never done UK train riding before. Whether you come by train from London, or from Manchester, you almost always get off at Leeds (you shouldn't miss it, it's frequently the last stop of several of the routes – I say “frequently” -- but not always! Pay attention!!) . 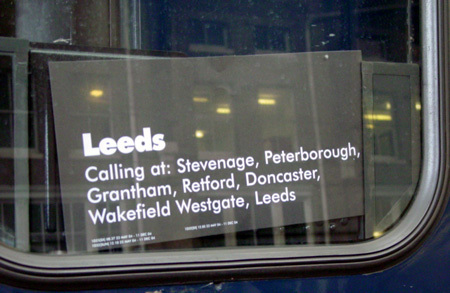 At Leeds, you transfer to a local train service, Leeds to Bradford. 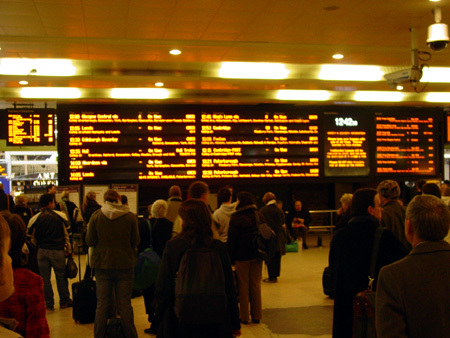 The Leeds-Bradford services operate about every 15 minutes, and it's about a 20 min. ride Some are direct to Bradford Forster Square, some involve another change. Special note: There is (or have been, in the past -- it still shows in the timetables) at least one train per day between London King's Cross and Bradford as direct, no-change-of-trains service. You get on in London, off in Bradford. "Easy as pie". The one listed now leaves London around 5:30pm, and arrives in to Bradford Forster Square around 8:20pm -- a bit on the late side if trying to catch any movie events that evening. However, if you are not otherwise planning something in the early evening, it eliminates all the "change at Leeds" business. (It goes through Leeds anyway, you just don't have to get off there!)... Details at that rail planning site. Be aware that there are two rail routings between Leeds and Bradford..
And, just to confuse you, there are two separate train stations in Bradford! They're not so far apart, really -- if you are just walking at a normal pace, without luggage, you could walk between them in, maybe, 8 to 10 minutes. With baggage, it would be more. The train services out of Leeds run at 15 minute intervals, alternately going to Bradford "Interchange" station, and then Bradford "Forster Square" station. There are the two different stations in Bradford, one called "Interchange Station", the other called "Forster Square Station". 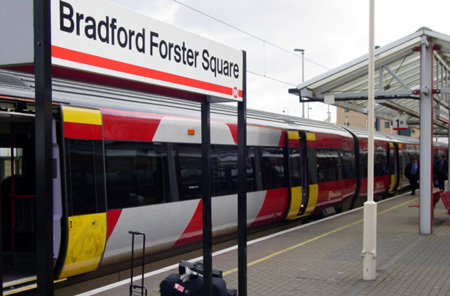 Either station will get you into central Bradford, but (IMHO) the station you want is the "Forster Square Station", because it is only about 100 yards easy walking distance to [my] preferred hotel, the "Midland". (see "Hotels", below). If you have to wait for the train to the Bradford station you want, I recommend you do that wait there in Leeds, as opposed to taking an earlier train to the less-preferred station. You will have a good 10 min. walk, juggling those bags, or a taxi ride, at additional cost in Bradford, so ... as I say, you may as well wait the few minutes for the "correct destination" train! On the other hand, if you are on a day trip from within the UK, the "Interchange" station is the one closer to the NMM. If you are arriving without baggage from some other local UK city, "Interchange" is probably the better choice. My favorite is the last-listed one, the "Midland Hotel", partly because it's a historic building, built somewhere around the late 1800s, and is (or was) formerly an old "railway" hotel. Also, it has, in recent years, become the "official" hotel of the WSW events. Nice, classic, brick structure. They have (usually) lots of rooms, singles and doubles, reached via somewhat labyrinthine corridors. Sometimes you can pre-arrange to share a double with someone, and when you book your room, you should mention that you are attending the Bradford Film Festival and/or the Wide Screen Weekend, as there are usually some kind of special rates. No matter what, lower rates usually prevail on weekend nights. In '05, my net Visa charge was for £167, and I was billed $330. In '06, my net Visa charge was for £186, and I was billed about the same, some $330. 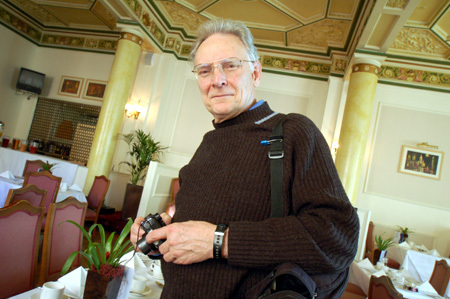 But the 3 nights in '07 (my Visa bill doesn't show the '07 cost in UK £ ) cost me $422. Like I say, travel costs add up... But still it's a nice hotel, and the [included] hot breakfast is quite hearty (ham and eggs and cereal and tea and rolls and juice and beans and ...more toast and jam and ... ) And all that will help keep you going during the day. There are other hotels, as I listed before. You may check them by doing a web search for "'hotels'+'Bradford, England'". Caution, though, as some may be a bit farther out from the city center. Keep in mind that time can be of the essence. One cash-strapped guy I know sought to save absolute $ by staying at the lowest-price hotel that he could find, which was the Travelodge. But he realized (later) that he spent about 40 minutes per trip each direction, walking back and forth to the hotel, which kind of ate into his available time for seeing films and talking with other people attending ... So, after all was said an done, he felt it was a bit of a "false economy". I've never tried one in Bradford, but "bed and breakfasts" are quite common in the UK, and usually the least expensive for accommodations. However, they may be located some distance away from the center of the city. There is local bus service along several routes through the city, but my priority has been to stay near the NMM in order to be handy to as many events as I wish to see. And those local buses later in the evening can be few and far between! I checked the Midland Hotel's online rates listed in December '07 for a single room in March 2008, and it seemed to work out to about £66 (for a single) per night, but that was for 4 nights, some "weekday", and some "weekend", so -- who knows, see what comes up on your own search. You can book via the online links, or telephone them, at (+44) (0) 0124-735-735. Fax is (+44) (0) 1274-720-003. 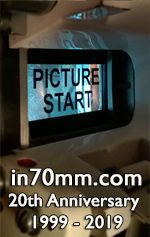 This "in70mm.com" website has some up-to-the-moment hotel and event pricing information posted as well. There are several various choices, varying in level of quality and service. "You pays your money and takes your level of service", you could say. 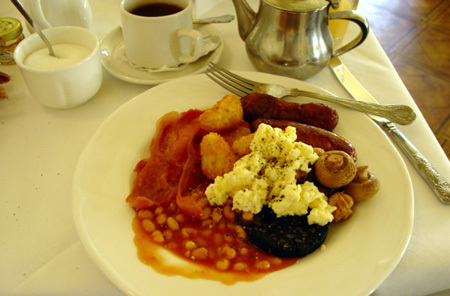 The Midland Hotel's breakfast is a splendidly hearty way to start the day. And that's included in your room rate. Later in the day, there is a cafeteria inside the NMM which functions daytime hours, and you can get quick helpings of sandwiches, soup, hot dogs, and other hot (and cold) food without having to spend much time in going out. There's also a small "bar" right in the theatre lobby, with coffee, tea, beer, cookies, and the occasional croissants and light sandwiches (supplied from the NMM cafeteria). Alternatively, going a bit further out, there's the "franchise" options. Your basic Burger King, and a McDonalds -- and other "fast food" spots -- in central Bradford, which you can get to in a 7- to 10- minute walk from the NMM. And there are other places, too: one at the Midland hotel, as well as a very good Indian restaurant just up the hill from the NMM -- but you'll need to allow time for a full meal there, they are not "eat and run" places. OK, so central England isn't Tahiti, or anything resembling a tropical paradise. It's late winter (or early spring -- whatever! ), and the weather can best be described as "blustery and changeable". Typically, in Fahrenheit degrees, it's maybe 45°F or so daytimes, and 35°F, or lower, nighttimes. (That's approximately 7°C days, and 1°C to 2°C nights). Temperatures and conditions can shift significantly, so you may have a brief flurry of snow, followed by hail or rain, and then sunny for a spell. All within an hour! Sometimes accompanied by rather windy days. So, bring warm clothing, which is wind-resistant, and be ready to take off a layer or two when inside! Umbrella a good idea, but if the wind really kicks up, keep that umbrella closed! There are several ATMs in Bradford, near the Midland Hotel. There is none in the Museum itself, but there is one near to the Museum, a short walk away outside. The ATMs will dispense £ notes from your overseas accounts, so you can get ready UK£ cash that way. (I don't recall seeing an ATM at the LBA airport, but there may be one). There is at least one bank right near the Midland Hotel, with an ATM colorfully named the “Hole in the Wall”. This bank (Barclay’s) is open on Saturdays, but is closed on Sunday, so plan accordingly. Hope this all helps you get a handle on setting up your visit.